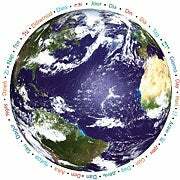 Today is Earth Day--the 41st annual day dedicated to raising awareness and inspiring appreciation for the Earth, and to teaching people how to be better custodians of the planet's resources. Companies of all shapes and sizes consume resources, and impact the environment in some way. In honor of Earth Day, Emerald Brand products has shared some tips and ideas to help organizations reduce their impact on the environment. Here are five ways you can honor Earth Day and take steps to preserve natural resources in your office. Figure out how to make every day Earth Day. 1. Turn off the lights! And the screens, printers, etc. I know this seems like an obvious one, but it is amazing how many empty rooms still have lights on, and how many electronic devices that are rarely used are left perpetually on--just in case. 3. Use both sides of paper for printed documents. Why use double the paper, when you can cut your waste in half immediately? This is a great policy, particularly for internal documents and drafts. Another paper-saving option for printing of drafts and internal documents is to use a smaller font and wider margins to maximize the use of the paper. 4. Offset your carbon footprint. Give something back to the environment on Earth Day. Workers consume resources all year. On Earth Day, plant a tree or three to give back to the Earth and make sure that the planet's natural resources are not exhausted. 5. Talk about Earth "Year." I don't want to take away from the value of Earth Day, but you don't have to confine your planet-saving efforts to one 24-hour period each year. The idea behind Earth Day is to educate people to be better stewards of natural resources and the environment all the time, not just a one-day blitz to absolve our conscience for the rest of the year. Use the day as an opportunity to talk with your coworkers and supervisors about what the office can do to become more eco-friendly over the next year. From conserving energy, to replacing traditional break room products with eco-friendly substitutes, there are plenty of ways for companies to go green without breaking the budget. And, one final bonus tip: upgrade. You might think you are saving the bottom line by wringing every last byte out of your existing servers and PCs, but you will do the Earth--and maybe even your budget--by using newer hardware that is more environmentally-conscious and energy efficient. You can also cut down on your organization's carbon footprint by embracing virtualization so you can run multiple virtual servers from a single physical server. So, what are you doing to honor Earth Day, and how can your organization pay it forward and take better care of the planet throughout the year?